Where is the posts since last visit button? All I want is that and I'll be set. Doost wasn't made admin to be King's partner, Doost was made admin as his replacement. I'm kidding, obviously, but I'd really like to hear the story as to how he landed his slot. 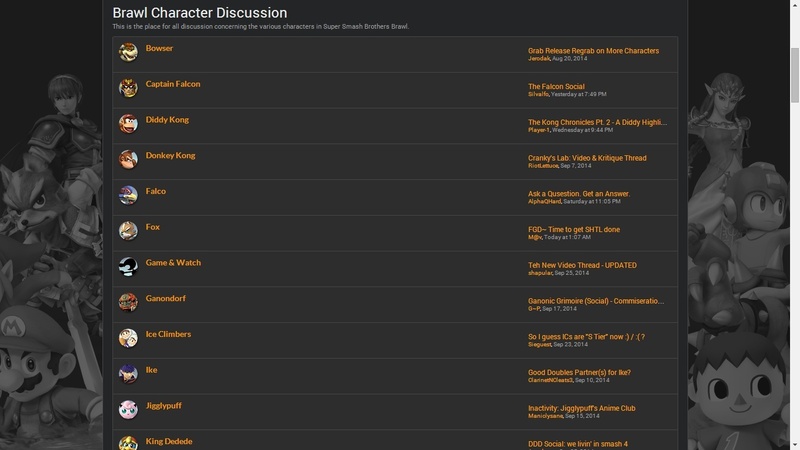 GigaPichu had a full sheet from the expansion forums, and I think it was Jaklub who coded him as a joke, not to actually be implemented in the final build. Felipe saw Weegee, thought it was hilarious, and brought it to Falcon8r, who still worked on Crusade by that point. Falcon8r ended up putting Weegee in the public release. So like me, he was a mistake and a joke. Cool beans. -In it's place, the 'Toolbox' has been added and will function by providing useful buttons such as "Mark all posts as read" and "View posts since last visit." Please note that the appearance of these buttons are only placeholders as of now. Each board and subboard has been exposed and has index on homepage. This is to make searching topics a whole lot faster and makes the homepage show more options for new visiters. Do you like this better or prefer it to go back to the way it was? Makes us look like a bigger community. Do you guys prefer it exactly how it is now or like the old one better? This change is very good, very very good. EDIT: This second one, not as much. The border to the right of everything seems too thick. It also looks kinda clustered up. Posts and categories are now even further separated with lines, let me know what you think of this change as well. If I'm able to make a suggestion, but I'd move the Game Announcements and Dev Blog boards into the SSBC category since those boards are mainly about the game imo. Useful Links section at the bottom of the homepage has been updated. May or may not be moved to the top of the page, let me know what you think about the placement. Shouldn't Crusade General Discussion be on top of it's section? That would be nice, but if you guys have any other plans, you just go for it. I find that the images that mark the sections are all too wide. Is that just me tho?